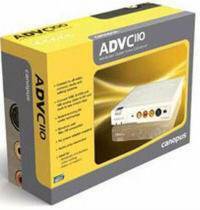 Use ADVC110 to connect all analog and digital video cameras, decks and editing systems. ADVC110 is a portable and easy-to-use digital video converter compatible with Windows and Mac OS computers. ADVC110 is the ideal device for capturing and outputting analog video from any FireWire-equipped notebook and desktop computer. There are no drivers to install and ADVC110 does not require a power supply when used with a 6-pin FireWire cable. *The ADVC-PSU5V AC Adaptor Kit (sold separately) is required when connecting ADVC110 to a 4-pin IEEE 1394 FireWire port. ADVC110's intelligent usability allows for easy setup and connection in any video environment. Front and rear connectors provide analog and DV signal pass-through and ensure that connecting cables is neat and simple. At the heart of ADVC110 is the innovative Canopus DV codec chip, providing the industry's best picture quality preservation during analog-to-DV and DV-to-analog conversion. *ADVC110 accepts SECAM video input only. *ADVC-PSU5V Adaptor Kit sold separately.